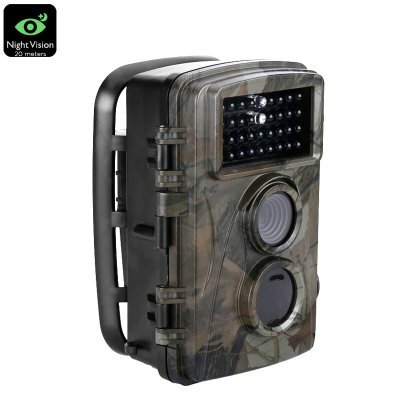 Successfully Added 720P HD Trail Camera - 5MP CMOS Sensor, 20 Meter IR Flash, 20M PIR Sensor, 0.6 Sec Trigger, HD Video, 12 Month Standby to your Shopping Cart. This stunning HD trail camera has a 5MP CMOS sensor and PIR sensor with 20 meter ( 65ft) range. Covering a 40 degree angle the PIR (Passive Infrared) sensor will detect the changes in temperature that occur when a subject passes in front of the camera. When detected the trail camera will be activated in the blink of an eye thanks to its 0.6 seconds triggering time. With interpolation letting you boost the resolutions to 12 MP you can enjoy great quality images for easy identification. Equipped with 36 IR LEDs that have a 20 meter IR flash range you can be sure of quality images even on the darkest of nights. Additionally this game camera lets you record video footage in HD 720P and a 60 degree camera lens provides a wide field of view. With 4 operational keys, 3 fast setting options for mode, delay, and resolution as well as an LCD status screen setups are quick and easy. The micro SD card slot means this game camera can store up to 32GB of recordings while an AV output port makes it easy to review the footage with the aid of a portable screen. Protected by a robust case and with an IP54 water resistant rating this weatherproof trail camera ensures you can leave it outdoors without worry, safe if the knowledge that when you return you'll have great footage of the local wildlife. All images and video are stamped with the day and time so you can see which animals are active during different times of the day, month and year letting you monitor a location for prolonged period ensuring you always know exactly where to go come hunting season. The battery chamber takes 4 AA batteries but is expandable to 8AA batteries allowing it to operate all year in standby if required. This 5MP Gama camera come with 12 months warranty, brought to you by the leader in electronic devices as well as wholesale outdoor gadgets and trail cameras..